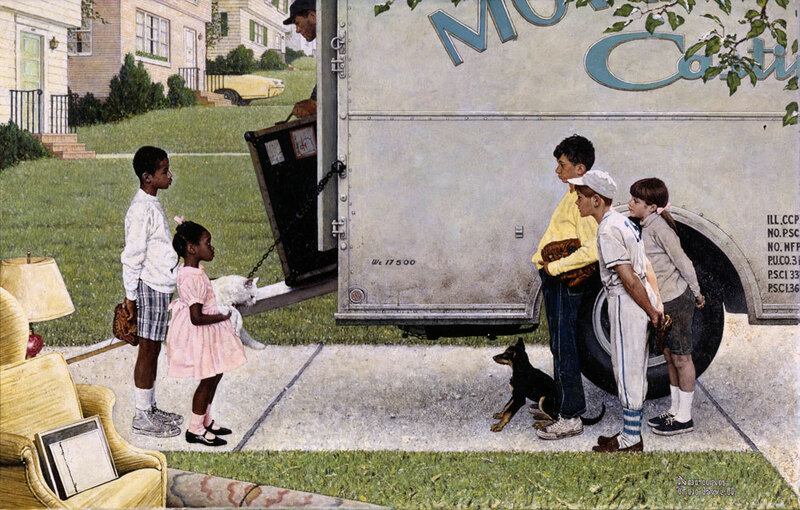 New Kids in the Neighborhood, Norman Rockwell. 1967. If you have not done so already, let children know a bit of history about the civil rights movement. You might say, it used to be that black children were not allowed to do many of the things that white children were allowed to do, just because of the color of their skin. They were not allowed to go to the same school as white children, drink from the same water fountain, eat at the same restaurants or swim in the same pools. In some places, they were not even allowed to play together! Some grownups just did not seem to understand that all people are equal and should be allowed to do all the same things! But many grownups and kids did understand and they worked really hard to change those rules and laws. They started a movement called The Civil Rights movement. They worked every day to make sure people would be treated as equals in the future. They wanted all kids to have the same chance to play, learn, and grow. [You may wish to mention some Civil Rights leaders like Martin Luther King, Rosa Parks and Ruby Bridges] And after a lot of hard work, things finally started to change. How are the children in this picture the same? How are they different? What do you think they will play together? Ask children, would these children have been allowed to live in the same neighborhood and play together before the civil rights movement? Why not? Now ask children to reflect upon what it might have felt like to be left out of restaurants, and play dates, and schools just because of the color of their skin. Go around the circle and have children name reasons that they are thankful for the Civil Rights Movement and for leaders like Martin Luther King and Rosa Parks. Finally, have children draw scenes showing a world where everyone gets to play together and be friends. Try these activities to go even farther with your explorations. Ask children to think of something they might do to help make the world more equal (or fair) for everyone. If possible choose an issue that you can address right in your classroom. For example, how can we make things more fair during choice time? How can we make sure that everyone gets a turn to use the blocks? Read age appropriate stories about The Civil Rights Movement and continue the conversation about equality in the United States and around the world.